I know you’re out there. You’ve got that great food biz idea. And some of you need to take that idea and enter the Hottest Kitchen Entrepreneur Challenge. Indy has so many creative food entrepreneurs that this year’s challenge is going to be a great competition. Anyone with a cool food or beverage business concept or early-stage business that could use a boost should enter the challenge, a regional contest to find Indiana’s next great food or beverage entrepreneur. The competition is sponsored by Ivy Tech Community College and by Reliable Water Services, a statewide provider of commercial water heaters, boilers and water softeners. The challenge features a start-up category for those with a new food business idea that’s not yet in the market and an early-stage category for new businesses that have been operating five years or less. $250 shopping spree from Zesco.com restaurant supply. “In addition to seed money and other great prizes, the challenge offers a unique opportunity to gain advice from some of Indiana’s most successful and savvy food and beverage entrepreneurs and experts,” said chef Jeffrey Bricker, hospitality department chair/associate professor at Ivy Tech Community College. 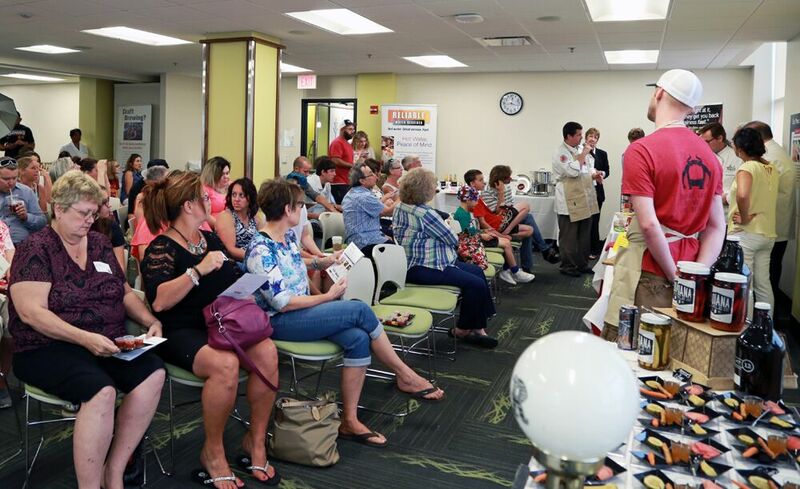 Participants at the 2015 Hottest Kitchen Entrepreneur Challenge at Ivy Tech. Last year’s start-up category winner, Indiana Pickle Company’s Robert Carmack, who makes beer- and spirit-infused pickles, said the push from winning helped him take the next step in his business. “The Hottest Kitchen Entrepreneur Challenge was an amazing experience that has opened so many possibilities for me,” said Carmack.